Heavy meals, overeating, indigestion, often associated with festive celebrations. As one of our Chinese festivals, Mid-Autumn aka Moon Cake Festival, is approaching, I would like to share this salad dish with you. Since we tend to eat generously during festive seasons, it’s good to have some refreshing salad to ease your stomach sometimes. And here, I have this nice salad dish where one of the essential Mid-Autumn festive food, pomelo, is used in it. Pomelo (柚子, in Chinese as “You Zi“), a mild grape fruit-like citrus fruit, with honey sweet taste. I first tasted this salad during the festive celebration organized by the RC in my neighborhood. I loved it a lot. 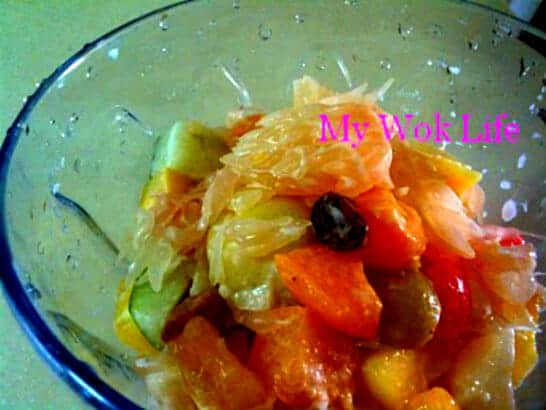 And I think it is a very good idea for having the festive fruit, pomelo, in salad. This way makes the pomelo much easier and delicious to enjoy. Some interesting ways to have this fruit now.. And you may even get your children to help to do up this salad dish together! Mix all fruit ingredients in a salad mixing bowl, including pomelo and raisins. Add in mayonnaise. Stir to combine well, using a spatula. Chill in refrigerator for an hour before serve. 1 serving of Pomelo salad counts about 180kcal. Tips: Fruit cocktail should contains diced peaches, pears, peeled green grapes, cherries, and etc. * Choice of using just the mayonnaise or yogurt is also recommended, if desired. * Just fruits, it’s vegetarian! Don’t use mayonnaise, for strict vegetarian, as mayonnaise contains egg products. * Melon baller in stainless steel material can be found in major supermarkets.